Facebook has made it a mission to connect the world. Whether unconnected, or poorly connected, there are several new initiatives on the horizon that could bring an estimated 1.6 billion people online. We were able to get a glimpse of a few of them at F8 today. 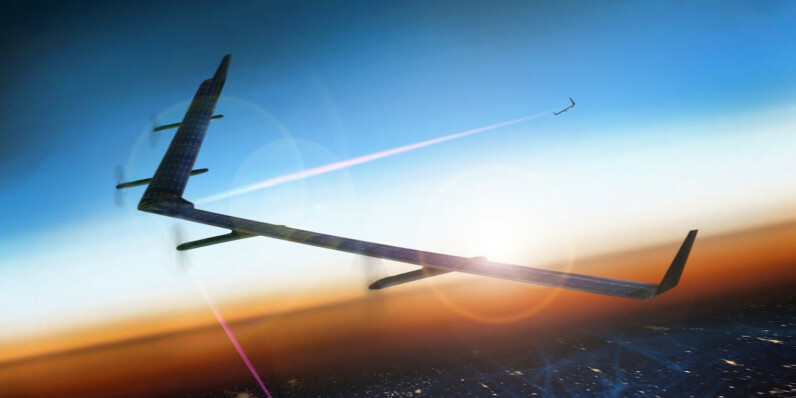 The most ambitious project is easily Facebook’s solar-powered Aquila drone. Aquila is a boomerang-shaped unmanned aerial vehicle (UAV) that dropped the tail, the fuselage and reliance on fossil fuels in hopes to remain airborne for months on end and deliver wireless connectivity to underserved regions. It’s ambitious, but success here could reduce the need for thousands of miles of cable, base stations and additional infrastructure requirements associated with getting huge sections of the map connected — a prohibitive expenditure for many areas of the world. Facebook also discussed two terrestrial-based alternatives: Terragraph and Project Aries. The former equips light poles and other ‘street furniture’ with powerful antennas designed to cloak an entire city in WiFi, while the latter is designed to beam this signal for increased coverage. To do this, Facebook plans to use the mostly unused 60 GHz frequency band, a band that’s unlicensed and mostly overlooked in many countries. While it lacks the power to penetrate obstacles as well as 2.4 GHz, the plan is to use these Terragraph systems to provide street-level connectivity in urban areas — starting with San Jose. To put it simply, the plan is for ‘street furniture’ — like light poles — to beam WiFi to a building through a series of interconnected distribution nodes. Once the building is connected, you can set about using Ethernet or access points to create building-wide coverage.